We love looking at the cards our customers create, seeing the ways you put your personal stamp on our designs and make them your own. So we decided it would be fun to feature a few each month as inspiration for all of us. This month, love was definitely in the air. Valentine’s Day cards were very popular, and many of you seemed to agree with us that personalized Valentine’s Day card ideas are better at getting to the heart of the matter. This Sweetheart Photo Valentine’s Day Card is one of our favorites because it does just that, with style and personality. The unique heart-shaped design and the gorgeous photo of this card combine to create the perfect valentine message to family and friends. We would feel very special and loved if we got one of these beautiful cards in the mail. And that’s what Valentine’s Day is all about—making someone else feel loved. 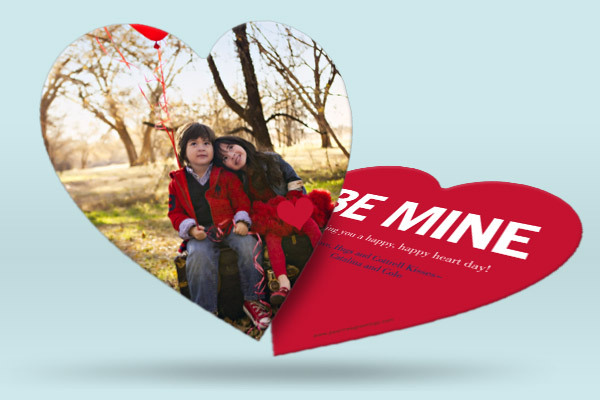 Look for more Valentine’s Day photo ideas on our blog, or start shopping and personalizing your own valentine photo card ideas today.